These include 100 percent sign up bonuses for their sportsbook, casino and poker room and a $600 casino sign up bonus. Bodog also offers a refer a friend bonus and a 100 percent kickoff bonus to their football bettors. 250$ Bonus 100% Deposit Bonus - $250 Value! The Bodog 100 percent sign up bonus is as easy to get as a bonus could be. To receive it, simply go to the Bodog bonuses page and select it from the available bonuses list when you make your first deposit at Bodog. The amount will be added to your account within 30 minutes, up to a maximum of $200. The bonus is only usable in the sportsbook, racebook and casino. You may use the bonus on any sport or wager type and at any odds. The rollover requirement is 5x in the sportsbook and racebook and 40x in the casino. If a withdrawal is made before all the bonus terms are met, all bonus funds as well as any money earned by wagering the bonus will be forfeited. Deposits can be made at Bodog via Bitcoin, credit card and Interac e-Transfer. A variety of other deposit options may be available depending on where you reside. You may want to contact the Bodog customer service team at 1-877-263-6422 for advice on which deposit method is best for you. Bodog wants to invite everyone to the party and invites you to include your friends in the fun of sports betting. For every friend that you refer who opts to sign up with Bodog, you will get a 200 percent bonus up to $100. You may refer as many friends as you like. There's no limit on the bonuses you can receive. Once they sign up, Bodog will hook your friends up with up to $1,800 in welcome bonuses and immediate access to their sportsbook, racebook, poker room and casino. The refer a friend bonus comes with a 5x rollover requirement in the sportsbook and racebook, a 6x rollover requirement in the poker room and a 40x rollover requirement in the casino. The referring friend must have at least one deposit in their history to be eligible for the refer a friend bonus. To ramp up the football season, Bodog offers a 100 percent kickoff bonus, matching all deposits dollar for dollar up to $250. The 100 percent kickoff bonus comes with unlimited redempton policy on Bitcoin deposits. Credit card deposits receive a one-time redemption on the offer. You can get cash back just for playing the ponies at Bodog. For starters, you'll get up to five percent back on your racebook play every Tuesday at 1 p.m. ET. That includes three percent back on all straight bets of win, place or show, although $2.10 and $2.20 payouts on $2 wagers are not eligible for the rebate. Exotic wagers - quinellas, exactas and trifectas, superfecta, daily double, Pick 3, Pick 4, boxes and wheels - garner a fiveper cent rebate. A one-time rollover is required on all rebates received. Horse futures and proposition bets made through the sportsbook aren't eligible for rebates and your account must be in good standing to get the rebate. No rebate will be given on canceled wagers or wagers refunded because of a scratch. Bodog offers a 100 per cent match bonus when you open an account with their casino, with a value of up to $400 on slots and $200 on all other casino games. In other words, you could rack up as much as $600 in bonus funds. In essence, this is a two-section bonus. Firstly, you get a 100 percent match bonus of up to $400 on slots, with a 25x rollover. Secondly, is what Bodog calls their "other games" bonus, a 100 percent match up to $200 on all other casino games with a 40x rollover. Sign up to the Bodog poker room and you can cash in on a 100 percent welcome bonus valued to as much as $1,000. Bonuses are paid out based on points earned by players in the Bodog poker room. The more Poker Points you earn in the 60 days following your deposit, the more bonuses you’ll get. For example, 50 points gets you $10 in bonus earnings but if you earn 10,000 poker points in your first 60 days, you’ll get a total of $1,000 in cash bonuses. The Bodog sportsbook is among the best in the business and an industry leader among those sportsbooks that cater to the everyday recreational bettor. They offer lines on almost every major sport imaginable and cater to the Canadian market, with emphasis on the NHL and CFL. Bodog's live and mobile betting operations are also top notch. 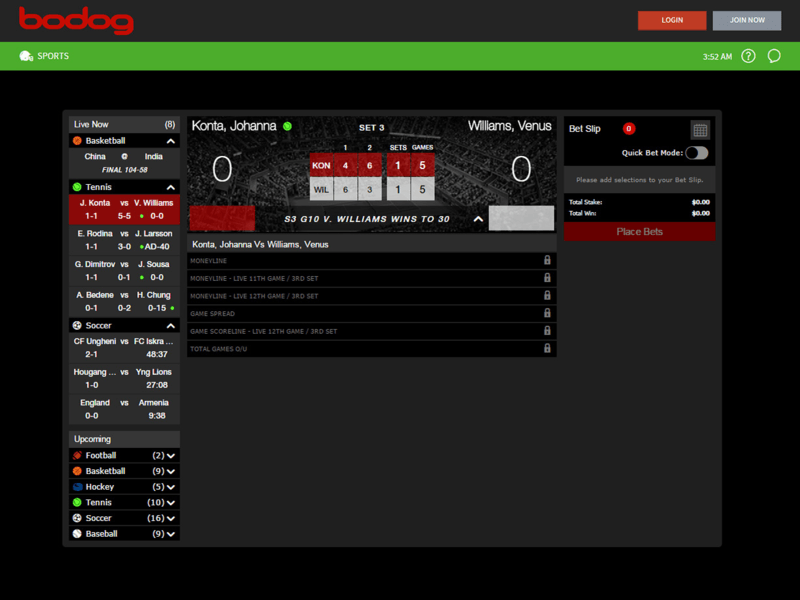 The Bodog website is clean, pleasing to the eye and easy to navigate. Their software, player perks, poker room and casino are also high class. Bodog is also one of the most recognizable names in the industry and has waged prominent mainstream ad campaigns with the both the NHL and CFL. No code is required to access any of the Bodog sportsbook 100 percent matching sign up bonus. The minimum deposit to be eligible for the Bodog 100 percent matching sign up bonus is $20. The maximum bonus paid out on the Bodog 100 percent matching sign up bonus is $200. The rollover requirement on the Bodog 100 percent sign up bonus is 5x in the sportsbook and racebook and 40x in the casino. Getting to the top, Bodog has no desire to slide off the peak of the mountain, so they are constantly offering new and regular bonus and promotiional incentives both to draw new clients and to remind their existing customers that they wll always matter. Beyond their popular sign up bonus, Bodog offers numerous weekly promotions, and regular special reload bonuses. It pays to subscribe to their newsletter, because you will always be up to date on the latest opportunities to cash in at Bodog. Close Visit and see for yourself... Ok! Let's Check Out !